At the end of 19th century, when Edison built the first electrical distribution networks, they were based on DC technology. However, with the invention of transformers, AC system proved to be much more superior to DC system at that time and AC systems were universally adopted for power generation, transmission as well as distribution. Electrical power is almost exclusively generated, transmitted and distributed in AC form. However, for certain applications, DC supply is absolutely necessary. For example, variable speed machinery incorporating DC motors, critical areas where storage battery reserves are necessary. Following are some points that make us think about dc power distribution. Advancements in Power electronics have made it possible to transform DC voltage levels and conversion between AC and DC efficiently. It is now possible to replace existing AC distribution network with DC distribution network. Distribution generation from solar and wind energy is increasing rapidly and both of these sources are intrinsically DC. A large number of office and household appliances internally require low voltage DC. These appliances are fed with AC supply and then transformed to lower voltage and converted into DC by an internal circuitry. Harmonic issues, phase balancing problems, skin effect etc. are not present in DC systems. DC energy can be stored easily in batteries and fuel cells. Such backup batteries can be utilized easily in case of supply failure. Wherever DC power distribution is required, AC power from the transmission network can be rectified at a substation using converting equipment and then fed to the dc distribution system. AC consumers can also be connected to DC system using a DC to AC inverter. A low voltage DC distribution system is of two types. As the name suggests, this system uses two conductors, one is positive conductor and the other one is negative conductor. The energy is transmitted at only one voltage level to all the consumers using this system. A typical unipolar dc power distribution system is as shown in the following figure. The above figures of unipolar and bipolar dc distribution system suggest that, DC to DC converter or DC to AC inverter can be installed at the consumer's premises according to consumer's or load's requirement. Consumers can also be directly connected to the DC distributors if the distribution voltage level is similar as per their requirement. DC distributors are usually classified on the basis of the way they are fed by the feeders. Following are the four types of DC distributors. 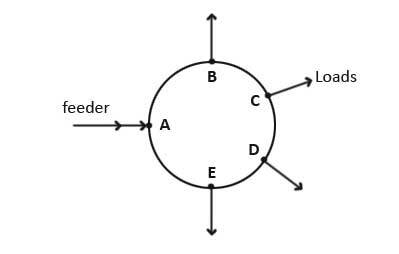 The current in various sections of the distributor away from the feeding point goes on decreasing. From the above figure, the current in section DE is less than the current in section CD and likewise. The voltage also goes on decreasing away from the feeding point. In the above figure, voltage at point E will be minimum. In case of a fault in any section of the distributor, the whole distributor will have to be disconnected from the supply. Thus, continuity of supply is interrupted. In this type, the distributor is connected to supply at both ends and voltages at feeding points may or may not be equal. The minimum voltage occurs at some load point which is shifted with the variation of load on different sections of the distributor. If a fault occurs at any feeding point, continuity of the supply is ensured from the other feeding point. If a fault occurs on any section of the distributor, continuity of the supply is ensured on both sides of the fault with respective feeding points. The conductor cross-section area required for a doubly fed distributor is much less than that required for a distributor fed at one end. As the name implies, the distributor is supplied at the center point. Voltage drop at the farthest ends is not as large as that would be in a distributor fed at one end. In this type, the distributor is in the form of a closed ring and fed at one point. This is equivalent to a straight distributor fed at both ends with equal voltages.